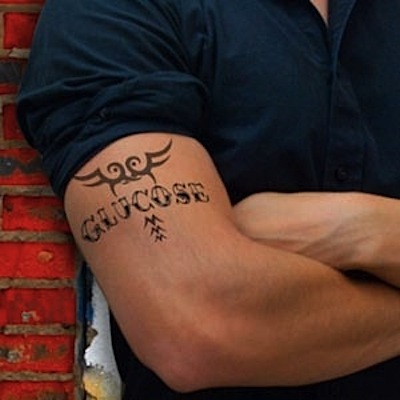 A nanoparticle-based tattoo that can monitor glucose levels in the blood of diabetes patients is under development by researchers at MIT. If it works, millions of people who endure small needle sticks several times every day may get some relief. The sensor is based on carbon nanotubes wrapped in a polymer that is sensitive to glucose concentrations. When this sensor encounters glucose, the nanotubes fluoresce, which can be detected by shining near-infrared light on them. Measuring the amount of fluorescence reveals the concentration of glucose. June's body is a tracery of lambent lines, like some arcane capillary circuitry in the core of Mao/K'ung Fu-Tzu. Following the current craze, she has had a subdermal pattern of micro-channels implanted. The channels are filled with synthetic luciferase, the biochemical responsible for the glow of fireflies. A similar system is being tried in the UK with fluorescent polymer microbeads; see Diabetes Tattoo Tests For Glucose Levels .